Huntington's revenue is up and expenses are down, according to a report from Cathy Burns, city manager. Burns briefly discussed the state of the city's finances during a pre-council Finance and Administration meeting. "We're bringing more money in than spending out," explained Mayor Steve Williams, adding that "the discipline enacted this year is working... we are in excellent shape." Based on the November 2017 financial statement, 42% of the fiscal year has passed. "All departments are under expenses," Burns beamed, adding that a newly combined building maintenance line item stands at 60%. The items were combined to "get a better understanding of costs." Revenue projections are up except for personal property tax which in this case reflects lowered inventories at two commercial enterprises. B & O , sales tax, municipal service fee and city service (user) fee collections are all up. Williams during the council meeting explained revenue is $23.8 million (45% of the yearly projection with 42% of year past) and expenses are about $18.76 million (38% of projected expenses with 42% of year past). Like the State of WV which has announced that revenue collections are up, the Mayor said concerning the city's fiscal position, "this is a good kind of a signal... trends are in the right direction." Burns explained that city cash flow has improved from a ten page list of accounts payable some extended to 90 days vendor payments to one page with only a few extended to 60 days. 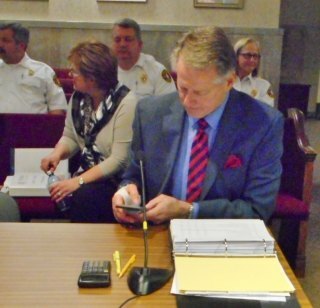 Still, the police and fire pension funds remain behind, both Burns and Williams stressed. Pension payment run about $900,000 to $1,000,000 a month. During the council meeting Williams said payment have been up to seven or nine months behind. Currently, they are five months behind. However, the city in November made their final payment on the previous fiscal year pension. That payment is required to be made by February of the next year to qualify for a full state match. Last year the payment was made in January. "We are gaining ground," Burns explained . We are five months behind ($4.5 million) . We were seven months. We are paying on month as they become due." Williams indicated the goal is to catch up, but this will occur over an extended period of time, illustrating we're better but not there yet. He complimented especially the new council members who took office in January 2017. "You were baptized by fire," he said of the harsh budget cuts made to curtail what would have become millions of shortfall. Joyce Clark, chairperson of the Administration/Finance Committee, said, "given where we were last year... everyone should be commended."